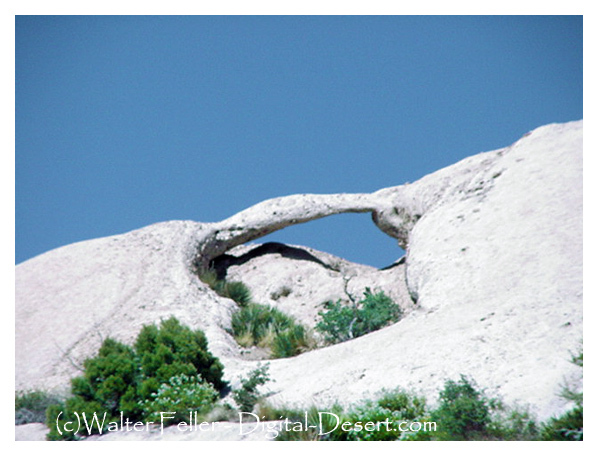 Generally, a natural arch is a span of bedrock supported at two ends with a span or clearance of six feet, and neither dimension being less than one foot. The longest span to be found in the Devil's Punchbowl is the Interchange Arch spanning 29' with a 6.5' vertical clearance. Devil's Perch spans 13.2' with a vertical clearance of 4' is the most prominent arch in the park and can be seen from the road about a quarter mile before entering the park. This tour contains photos of some of the arches in the park as well as vertical crevices and alcove enlargements. 360° photo of Devil's Punchbowl.